WASHINGTON (CNS) — When he was a child, Bassem Hazboun loved helping his mother prepare French delicacies in their Bethlehem kitchen. But it was his father who kept trying to steer him to study engineering as he reached his teens. “You don’t need this,” his father said when Hazboun told him he wanted to take a cooking course. But the passion he found while cooking by this mother’s side never left. “My food is my identity,” said Hazboun, a Catholic Palestinian who traveled in September from his native Bethlehem in the West Bank to showcase food from his homeland to various U.S. cities, including Washington and Connecticut, part of the “Room for Hope” festival. The festival aims to raise money for scholarships to help youth in the Holy Land study music, dance, cooking and other arts. 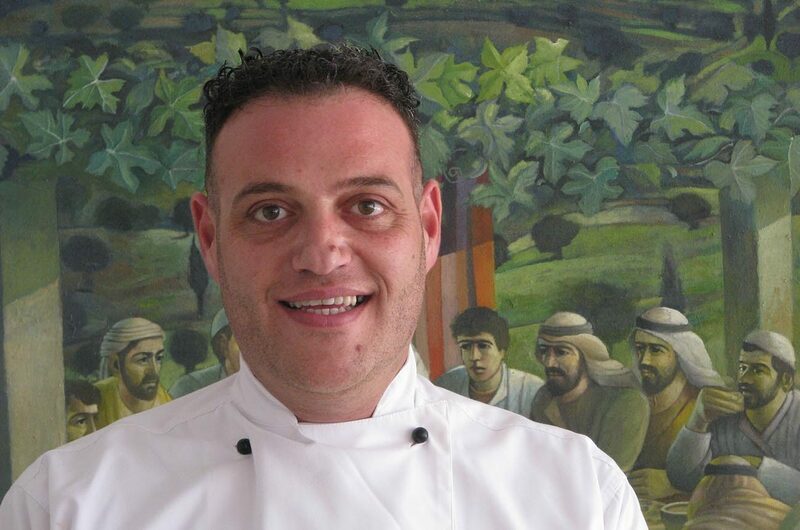 Chef Hazboun, 39, studied at Bethlehem University, a Catholic university in the Holy Land, and is the head of the culinary arts program at Dar al-Kalima University’s College of Arts and Culture in Bethlehem, which helps youth in the Holy Land hone skills in arts and culture. Hazboun said food from the Holy Land is in a way unique for Christians because some of it hails from biblical times. Sometimes he prepares biblical menus, he said, for those who arrive in the Holy Land for religious pilgrimages. This may mean a menu that includes a lentil soup, a dish of lamb and yogurt, too. Food from the Holy Land also features lots of olives, which are abundant in the region, he said, and spices you won’t find elsewhere. “All the foods are special,” he told Catholic News Service. In the U.S., Hazboun did several public food demonstrations and also cooked large-scale dinners so others could learn about the richness of food from the Holy Land. He prepared “musakhan,” a Palestinian roasted chicken dish served with onions, pine nuts and spices over flatbread; “maqluba,” which is “upside-down rice, meat and vegetables”; “mansaf,” lamb with yogurt sauce served with flatbread and rice; and 14 types of Arabic salads. It’s important for him, he said, to help his students develop a love for the food of their region and to see something positive about their identity as Palestinians through the craft. It’s a love that many of them can share with others and can also allow them to stay in the Holy Land, where work for Palestinians is scarce. Luckily, with tourism, many of them are able to find jobs at restaurants in Bethlehem, he said. “Sometimes I visit the restaurant and they feed me good,” said Hazboun. Beth Nelson Chase, executive director of Bright Stars Bethlehem in the U.S., the nonprofit that sponsored the festival, said programs such as the ones chef Hazboun teaches in Bethlehem help students learn skills that are useful for the economy of their homelands, where coming across a job can sometimes prove difficult. “It gives people hope,” Chase said. “We are excited to expose our friends in the U.S. to Palestinian culture and art,” he said.